A VERNACULAR OF VIOLENCE | Eric Baudelaire, Rita Sobral Campos, Claire Fontaine, Lisa Kirk, Sylvère Lotringer and Walid Raad. INVISIBLE-EXPORTS is pleased to present A Vernacular of Violence, a group exhibition of work by Eric Baudelaire, Rita Sobral Campos, Claire Fontaine, Lisa Kirk, Sylvère Lotringer, and Walid Raad. Pictures of violence wallpaper our lives, and yet they seem remote, aloof. Those images, demanding and harrowing, can seem nevertheless uniquely inaccessible in a visual culture that evangelizes the transformative power of the impulse to reinvent, recreate and in turn, demystify and deconstruct. The six artists gathered here, in an exhibition inspired by conversations with Lisa Kirk, approach violence and its representations as abundant and demanding source material — cultural detritus that is also cultural infrastructure — determined to deprive violence of the sacred space fashioned for it by inaccessibility. The work of each artist employs the use of facsimiles, mixing fact with fiction, as Rita Sobral Campos has written, to interrogate common convictions about culture and violence, and to offer testimony that the best way to know something is to remake it. Eric Baudelaire was born in Salt Lake City and lives in Paris, France. 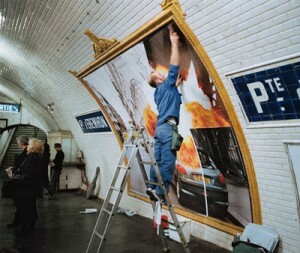 His work has been exhibited throughout Europe and North America. He is represented by Elizabeth Dee Gallery where he recently showed the first installment of a body of work named Anabases. Rita Sobral Campos lives in New York and has participated in several collective and individual exhibitions, among which are “On Rituals of Homecoming”, curated by Adam Budak, Lodz (2009), “Unclehead” in collaboration with Alexandre Singh, Lisbon (2008), “A Brighter Day” James Cohan Gallery, curated by Elyse Goldberg, New York (2006) and “Structural Schizophrenia” Culturgest Porto (2005). Claire Fontaine is a Paris-based collective artist, founded in 2004. Upcoming and recent solo shows include, Economies, Museum of Contemporary Art, North Miami, 06.10, Future Tense, El Museo Tamayo Arte Contemporáneo, Mexico D.F., Inhibitions, Reena Spaulings Fine Art, New York, After Marx April, After Mao June, Aspen Art Museum, Colarado, Arbeit Macht Kapital, Kubus, Städtische Galerie im Lenbachhaus und Kunstbau, München, They Hate Us For Our Freedom, Contemporary Art Museum St. Louis, Lucky In The Misfortune, Masion Descartes, Institut Français des Pays-Bas, Amsterdam, Feux de Détresse, Galerie Chantal Crousel, Paris and Claire Fontaine, The Exhibition Formerly Known as Passengers, 2.10, CCA Wattis Institute for Contemporary Arts, San Franscisco. Claire Fontaine is represented by Metro Pictures, Reena Spaulings Fine Art, New York, T293, Napoli, Galerie Neu, Berlin and Galerie Chantal Crousel / Air de Paris, Paris. Lisa Kirk received her BFA from the School of Visual Arts and her MFA from the University of California. She has had solo exhibitions and projects at Invisible-Exports, NY; PS 1 MOMA; Galeria Comercial, PR; Participant Inc, NY; and MOT International, London. She has also contributed projects North Drive Press, NYC, Creative Time, NYC, and Charlie, NYC. She is represented by INVISIBLE-EXPORTS. Sylvère Lotringer is a literary critic and cultural theorist. A younger contemporary of Gilles Deleuze, Félix Guattari, Jean Baudrillard, Paul Virilio and Michel Foucault, he is best known for synthesizing French theory with American literary, cultural and architectural avant-garde movements through his work with Semiotext(e) ; and for his interpretations of French theory in a 21st century context. An influential interpreter of Jean Baudrillard’s theories, Lotringer invented the concept “extrapolationist” as a means of describing the hyperbolic world-views espoused by Baudrillard and Paul Virilio. Walid Raad was born in Chbanieh, Lebanon, in 1967. His work has been exhibited in prominent national and international exhibitions including one-person shows at the Hamburger Bahnhof, Berlin; the Henry Art Gallery, Seattle; the Kitchen, New York; and the Reina Sofia Museum, Madrid. Earlier this year “Scratching on Things I Could Disavow: A History of Modern and Contemporary Art in the Arab World” was exhibited at REDCAT, Los Angeles,and subsequently at Paula Cooper Gallery, New York. Raad’s work has also been presented at Documenta 11, Kassel (2002), Homeworks, Beirut (2005), the 2000 and 2002 Whitney Biennials and the 2003 Venice Biennale. In 2007 Raad was awarded the Alpert Award, presented by CalArts, Los Angeles and in 2009 he was the recipient of a John Simon Guggenheim Memorial Foundation Fellowship. He is a finalist of the 2010 Hugo Boss Prize, whose recipient will be announced in October. Raad lives in Beirut and New York and has been an Associate Professor of Art at The Cooper Union’s School of Art, New York, since 2002. He is represented by Paula Cooper Gallery.